Get ready for a night of observing the stars. Lets Get The Star Party Started! So you’ve got your binoculars or telescope and you’re having an observing session in your back garden, fine, but how dark is it really? Is your neighbours “security” light ablaze, has the sky been “tangoed” by street lights and how much of the night sky has been obscured by buildings and trees? Most of us accept this and make the best of what we’ve got, but wouldn’t it be nice if we could live in the countryside away from all this pollution and view the sky and see how it really should be! The concept was born in the 1920's in the USA, when a group of telescope builders formed the Springfield Telescope Makers group and met yearly at Stellafane in Vermont. During the 1970’s the increasing availability of commercially made telescopes spawned star parties across the US. It wasn’t until 1986 that Britain had its first star party at Birr castle, in Ireland. The basic definition of a star party is a gathering of observers under a dark (and hopefully clear) sky. Most events are held by local astronomy clubs a few times a year. 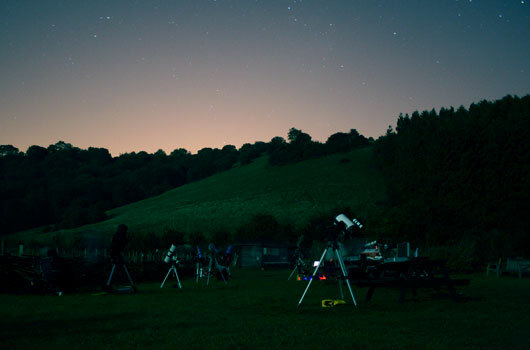 They are becoming more public organised events, so if you’re new to astronomy then a star party is a great introduction to telescope observing with a variety of optical instruments. Even during summer the nights can become rather chilly. Wearing multiple layers of clothing is best and if you get too warm you can take off clothing as required. Don’t forget your hat, gloves and a couple of pairs of socks, plus warm footwear is needed too. If you plan to stargaze into the early hours then a healthy snack is advised avoiding foods that are sticky and messy, especially if you plan to look through other people’s telescopes! A warm drink would be advisable as well, so don’t forget the thermos! A red light torch is essential! This will protect your night vision and others too while you navigate from scope to scope. Be aware of tripod legs, cables, chairs, stools, boxes and other obstacles. No white light - remember that you are in a “dark zone”, use your red-light torch. White light will ruin your night vision and anyone's nearby. Remember this when you arrive/depart to and from site, so be aware of your car’s headlights also the interior and boot light. If you are camping then also be aware of your lantern. If you smoke then your lighter would also be detrimental. If you intend to use a laser pointer, then check with the organiser, as some star parties prohibit the use of these too. Mind your Step – As mentioned above there will be obstacles as you go from scope to scope so again look out for tripod legs, cables, chairs, stools, boxes and other obstacles, tripping and falling onto a telescope will not make you popular! Ask first – Here the golden rule is to ask first before you touch or look through a telescope. Remember that everybody at the star party really wants you to look through their telescope. In some cases there may be astrophotography in progress and perhaps post mid-night you may find that some astronomers want to do serious observing on their own. Depart with care – If you are unable to stay all night then make sure your car is parked away from the site with your headlights pointing away from the telescopes. Make sure your interior light is switched of or covered up, oh, and don’t forget the boot light. Quiet, please – Avoid excessive noise between say… 4am and 10am. Consideration should be given to those who may be leaving the site that morning and to those who stayed up all night.